Geometric Dimensioning and Tolerancing, or GD&T, is the process of assigning dimensions and tolerances to features of a part in a way that makes it possible to manufacture, inspect, and assemble. This process involves the value associated with dimensions and tolerances, as well as a series of letters and symbols that describe different relationships and features. This process is universal in industry for producing parts and assemblies with a high degree of accuracy, and in most cases, including in SOLIDWORKS, GD&T follows the standard put forth by the American Society of Mechanical Engineers (ASME). The ASME puts out yearly updates to the GD&T standards that are referenced for clearly defining parts and assemblies but what does it look like in practice? If you’ve ever been in the position where GD&T is a part of your daily workflow, then you’ve likely encountered how confusing and time consuming that it can often be. Below, we give an intro into how to streamline this process using SOLIDWORKS and look at the tools that are available to help us do so. 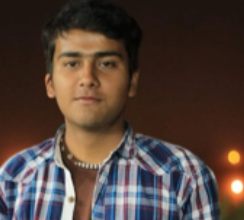 How does SolidWorks handle GD&T? 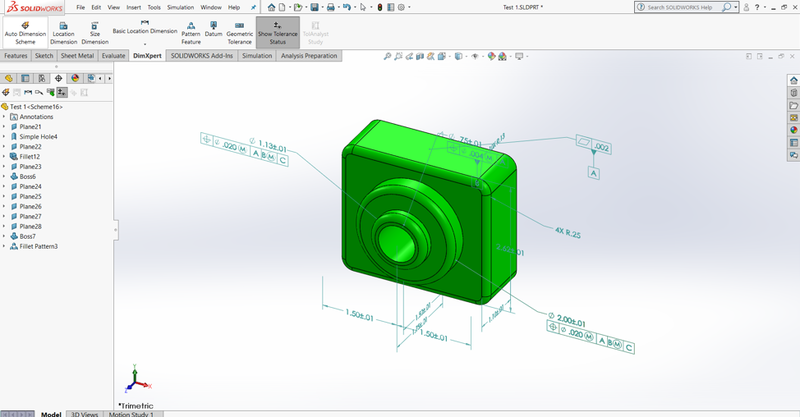 SolidWorks has multiple tools for tackling geometric dimensioning and tolerancing. 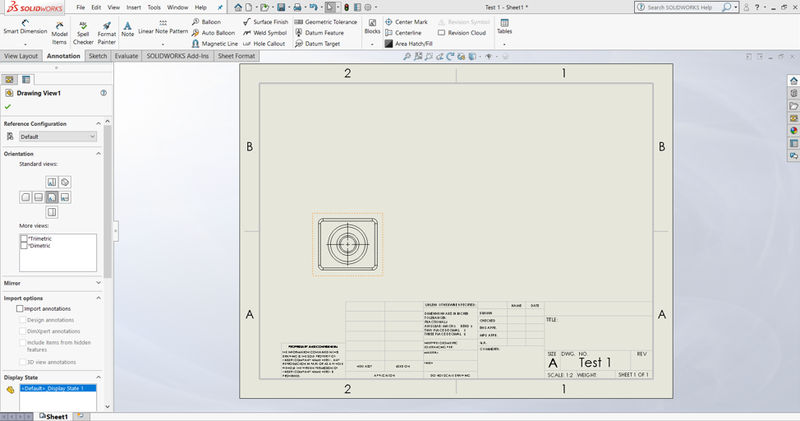 There is a full suite of “manual” drawings tools that will allow you to add any GD&T standards and symbols you want. In addition to these, SolidWorks has the DimXpert which allows us to automate much of our GD&T. 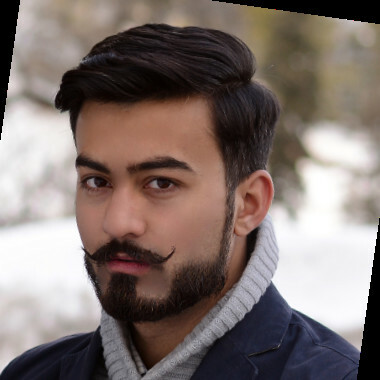 SolidWorks is a fully equipped software for modelling and detailing and as such has great tool sets for creating drawings with the proper application of GD&T principles. Before we dig into these we want to go ahead and be clear who this article is for. 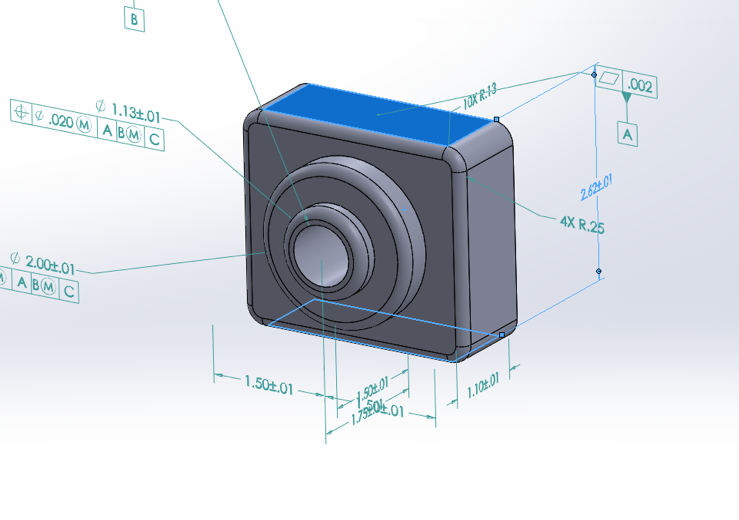 This article assumes that you have knowledge of the basics of GD&T and are curious how to use it within your SolidWorks workflow. We will not spend much time explaining what symbols mean or what datums are, and additionally some examples may depict parts with incomplete GD&T. These examples are meant to help describe the use of SolidWorks tools but not necessarily proper GD&T practices. That said, figuring out how GD&T works is only half the challenge. Applying it can, at times, be just as difficult. Within a SolidWorks drawing, there are tools for manually applying GD&T to views. This can be done using annotations, specifically using the “Geometric Tolerance” tool. SolidWorks drawing’s geometric tolerancing tools support the ASME Y14.5-2009 tolerancing guidelines. 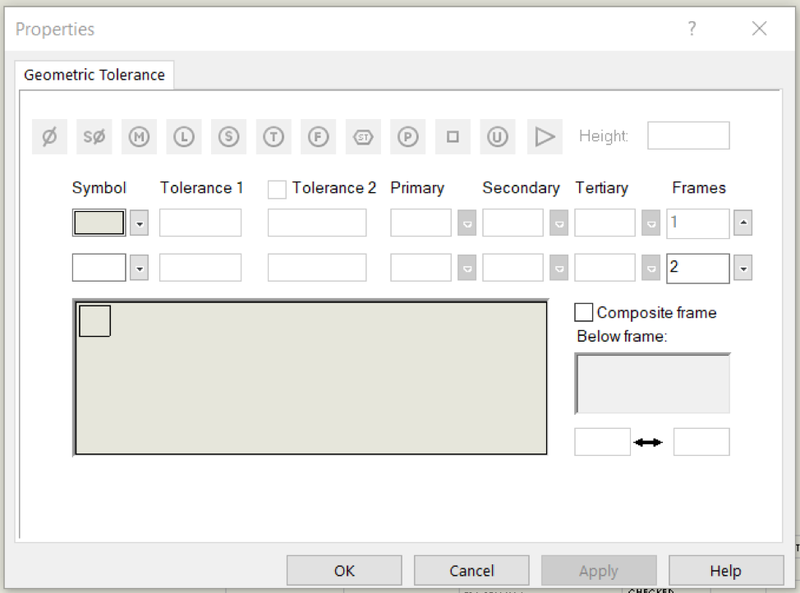 To add a geometric tolerance using this tool, select the tool and a menu pops up as follows. This window allows you to select what symbol you intend to add. It then allows you to add various other tolerances or dimensions while only allowing what can be appropriate for the chosen symbol. You still need a strong knowledge of GD&T to use this tool as there are still many options, but it does prevent you from creating a tolerance that cannot exist in the ASME standard. This is effective, but still very time consuming and difficult, to speed up this process, SolidWorks provides the DimXpert tool. 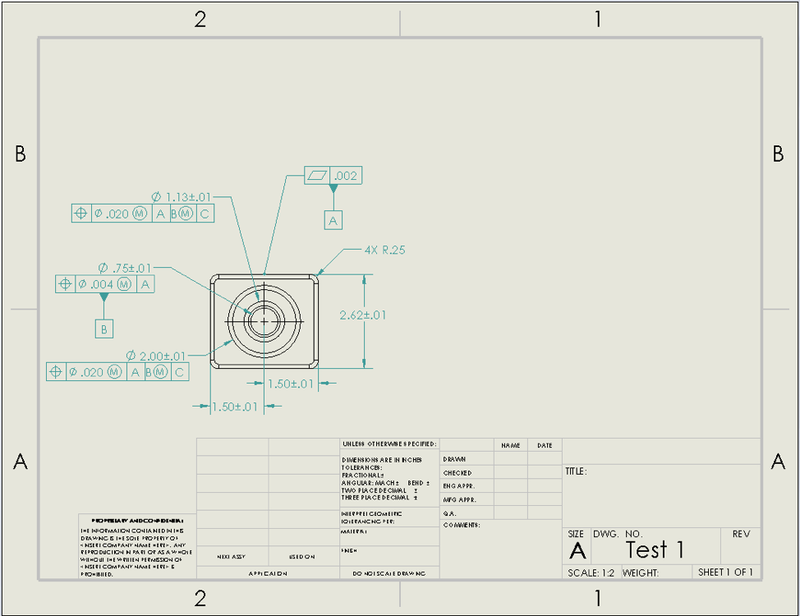 The DimXpert allows us to add GD&T to the part itself before creating the drawing. The DimXpert tools have their own tab where we can utilize these features. By first declaring our datums with the “Datum” tool, we can add dimensions to the part using the “Size Dimension,” “Location Dimension,” “Pattern Feature,” and “Geometric Tolerance” tools that contain proper GD&T in accordance with ASME Y14.41-2003. 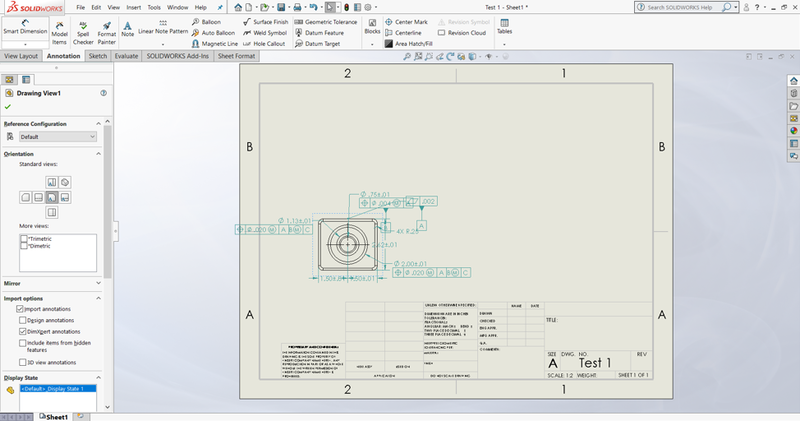 These tools work similarly to the annotation tools contained within drawing but can be done at the part level and then imported to the drawing. This method also carries the benefit of having the “Show Tolerance Status” tool. This tool highlights all faces of the part, using different colors to show if it is fully dimensioned according to GD&T standards. 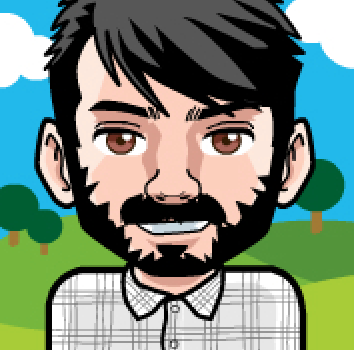 By default, this tool will use green to show features that are properly constrained, yellow to show features that are under constrained, and red to show features that are over constrained. Below we see this tool in use. We can see two faces, highlighted in yellow, that need more dimensions to be properly defined. Once we have applied dimensions, we can modify each individual dimension tolerance by selecting it and using the property manager. Likewise, we can modify a geometric tolerance by double clicking on it to bring up the properties window. If you find that you need to use a different standard tolerance than is set by default, you can also access the DimXpert options by going to Tools > Options > Document Properties > DimXpert and adjusting the default options there. We have full GD&T functionality using only these tools, but there is still another tool offered by SolidWorks that can often greatly improve our workflow. The “Auto Dimension Scheme” tool can be found in the DimXpert tab. Once we select this tool the property manager shows us the following. Using this tool, we see options to ensure that the output is what we expect to see on the final result. A great way to start understanding these options is to consult SolidWorks own literature, but we will give our own description here to help in use. The first option is between “Prismatic” and “Turned.” This option will change how geometric tolerances are applied based on how the part will be manufactured or tested. The next option is between the tolerance types “Plus and Minus” or “Geometric.” This determines How tolerances are applied, especially to hole patterns. 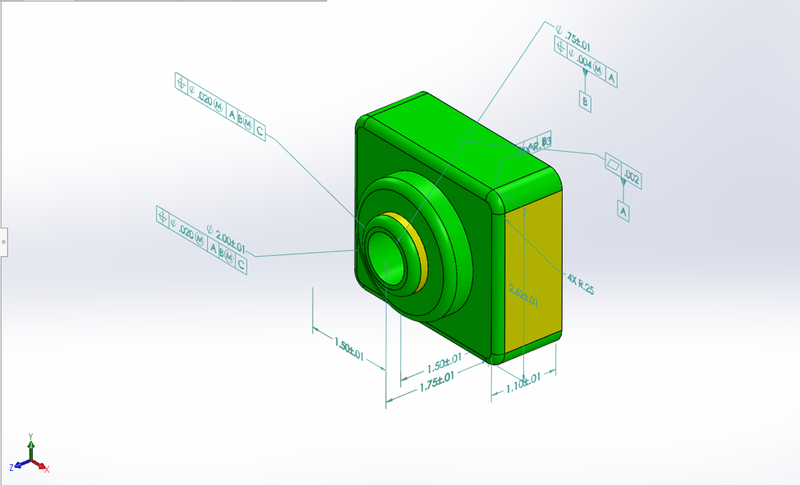 This can be a little more difficult to understand, but as SolidWorks phrases it, “The main difference between Plus and Minus versus Geometric is how DimXpert controls the four-hole pattern, and how it applies tolerances to interrelate the datum features when in Geometric mode.” Finally, we see pattern dimensioning options between “Linear” and “Polar.” This determines how the DimXpert will treat circularly patterned features, with the “linear” option dimensioning them from other features using standard plus and minus dimensions, and the “polar” dimensioning features on a circle around a central point and radially. The remaining options allow you to select your datums (you will be prevented from selecting redundant datums), choose the scope of the tool, and filter the types of feature that you would like the DimXpert to recognize. When you have all the options set to the correct setting you can select the green check to complete it. 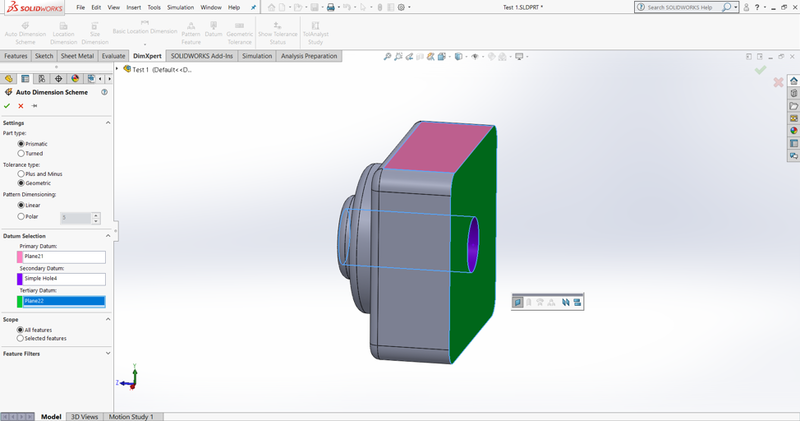 As you can see, SolidWorks has correctly defined all the features of this test part, and all the dimensions and tolerances can be seen. Most manufacturing shops today still won’t ever see the part file, however. 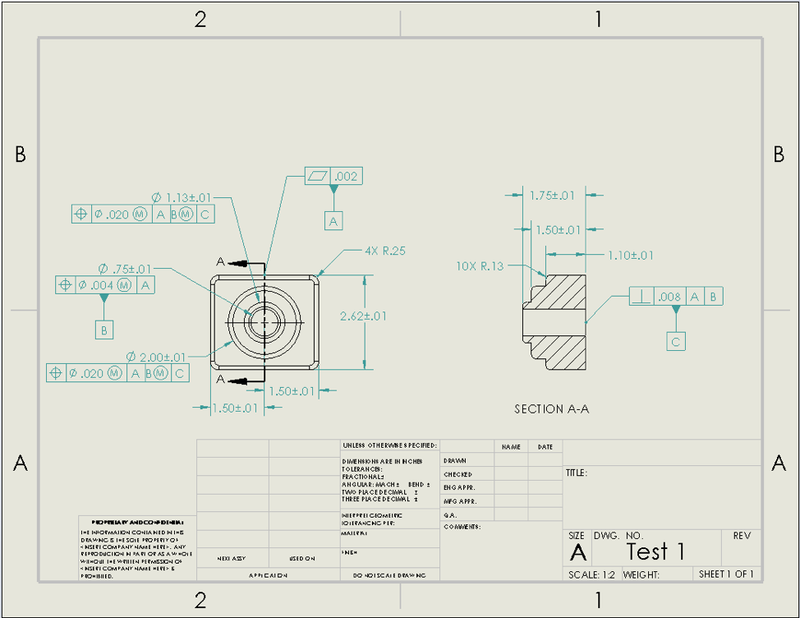 Luckily SolidWorks has tools for importing these dimensions into a drawing for manufacturing use. The dimensions and tolerances created by the DimXpert are considered annotations by SolidWorks. Applying these annotations to a drawing is fairly simple and starts with creating a drawing and inserting a view. Once the view is inserted, we can click on it and the property manager appears as below. By selecting the “Import annotations” and then the “DimXpert annotations” options, we see that all the annotations that we created with the DimXpert tool are imported into the drawing. We will only see the annotations that are visible with the part in the orientation that we placed in the drawing. In this case we only see annotations that would be visible in the front view. 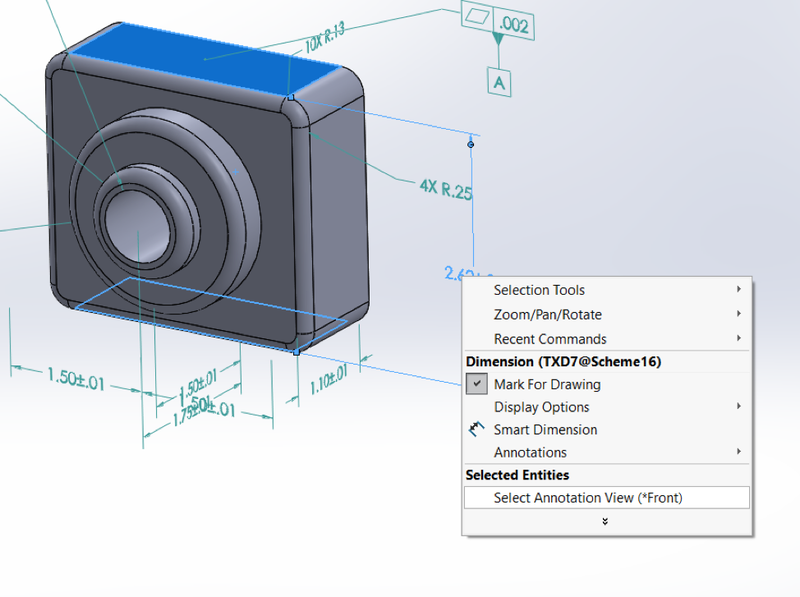 We can rearrange these annotations in the same way that we would any SOLIDWORKS drawing dimension. By clicking and dragging the dimensions to a new location we can achieve a much clearer drawing. We can use this technique on almost any view that we desire, including special views such as cut views as is shown below. 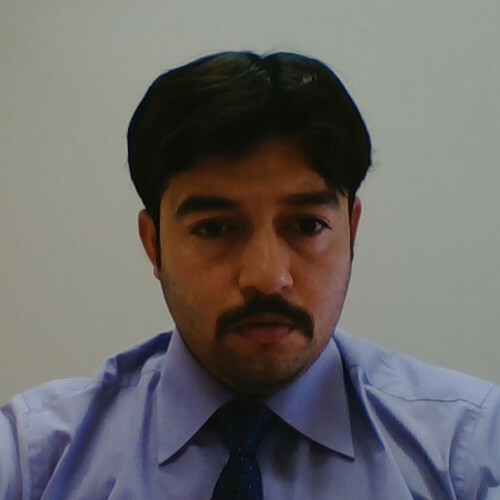 We are given other options as well to change the location of dimensions between views. This is done by returning to the model and changing the orientation of the dimension. By right clicking on a dimension or tolerance, we get the following menu. By clicking on “Select Annotation View” we can change the location of the annotation. Once we select the “right” for the new view, the annotation moves to be visible in the newly selected view. When we go back to the drawing, we see that it automatically updates to show us the new location of the annotation. This allows us to position our dimensions and tolerances anywhere that we want on the drawing ensuring that it is easily understood. We are also free to modify these automated annotations in any way that we want by deleting or adding to them using the manual tools that we covered earlier in this article. Using these tools effectively can allow us to create a clear, understandable drawing to correct GD&T standards much more quickly than starting from scratch. Understanding GD&T standards can be difficult in and of itself. Then using that knowledge to apply GD&T standards can be very time consuming and tedious. The tools that SolidWorks offers to apply GD&T standards can be invaluable for cutting down on the time that has to be spent on a drawing or part. 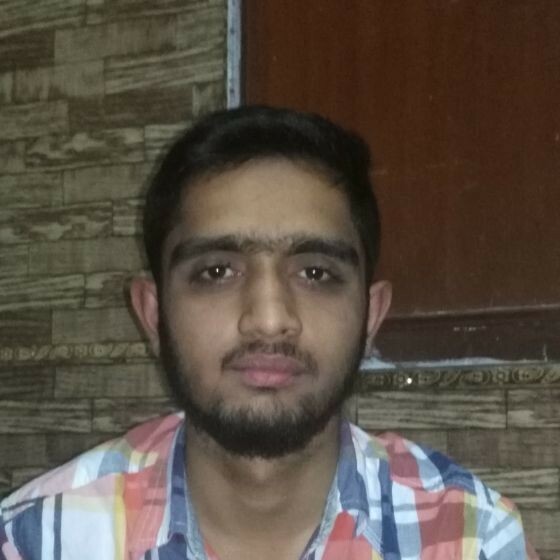 With proper utilization of SolidWorks DimXpert tools, achieving a fully detailed part with proper GD&T can be done in a fraction of the time that it would have taken without it.